When filmmaker Stephen Van Vuuren first saw images of Saturn retuned by the Cassini spacecraft, he saw something more in them. 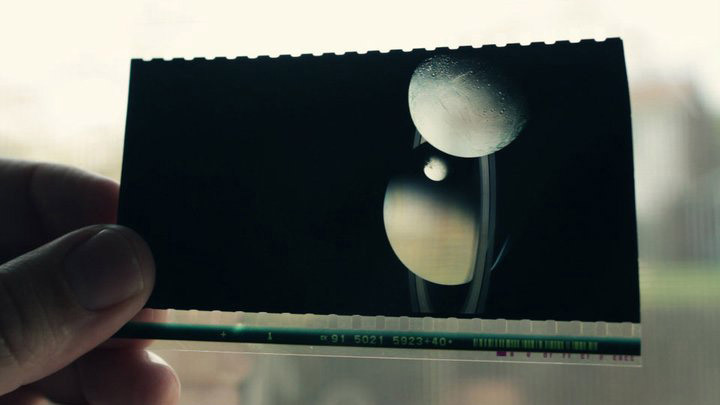 He not only saw the beauty of the ringed planet, he saw a motion picture camera flying through space. Van Vuuren grew up in Johannesburg, South Africa, with dreams of being an astronaut. He was accepted at MIT to major in astrophysics, but Stanley Kubrick’s film “2001: A Space Odyssey” changed his mind. He came to the United States to study filmmaking. Today he’s realizing both dreams and taking audiences along for the ride. “In Saturn’s Rings” is a non-profit film which animates over a million photographs from a variety of sources including those from Cassini which first inspired Van Vurren. Some frames of the movie are from a single photograph. Others, such as the movie’s visualization of the Big Bang incorporate thousands of images from the Hubble Space Telescope. The film also draws from imagery from the Lunar Reconnaissance Orbiter, Messenger, Suomi NPP, Solar Dynamics Observatory, Mars Reconnaissance Orbiter, Venus Express, Rosetta, Dawn, Galileo, Voyager and Apollo programs. A subject this big requires a big presentation. The film is being made for giant screens like IMAX theaters, fulldome planetariums, and 4k digital cinemas. 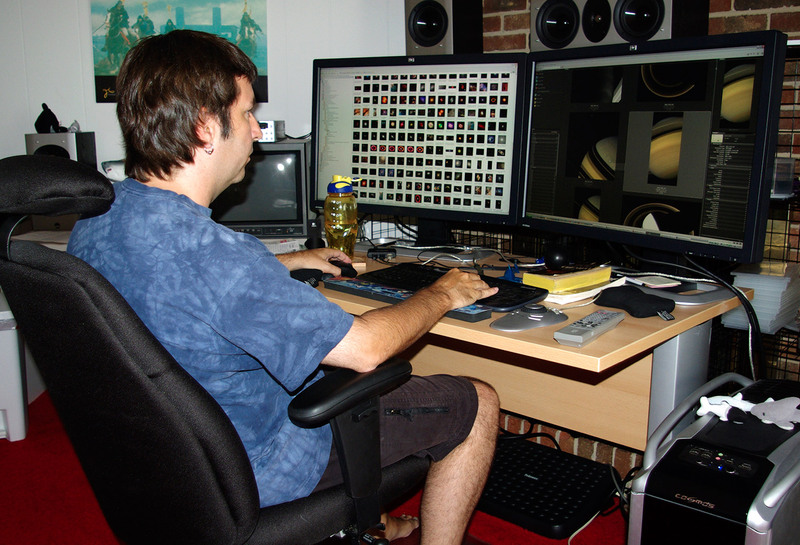 This requires a tremendous amount of storage space on the computers being used to create the film. “The final film will consume about 50 to 65 Terrabytes” says Van Vuuren. That’s enough space for over 200 Blu-ray discs, 100,000 CDs or the text in about 250 million books. Van Vuuren describes the film as a work of art created through science. A soaring performance of Samuel Barber’s “Adagio for Strings” by the Greensboro (North Carolina) Symphony accompanies the audience as they fly along with the Apollo 17 astronauts, above the Earth with a Space Shuttle orbiter and as they enjoy a front row seat to the Big Bang. Images don’t just come from NASA and the European Space Agency. Astrophotographer Colin Legg ventured hundreds of miles into Australia’s Gibson Desert to capture the night sky free of any light pollution. Over 11 days and nights the custom built rig consisting of five digital SLR cameras tracked the sky producing over 111,000 images. Back in Greensboro eight computers are spending six weeks stitching those individual photos together in a super high-resolution image with a stunning view of the Milky Way. Early animation tests were featured on NASA’s Astronomy Photo of the Day and went viral. Two million plays later, a team of more than 35 have volunteered their time and talents in processing images after seeing those early clips. It all comes together in the basement of Van Vuuren’s Greensboro, North Carolina condominium on an array of computers, most built by Stephen himself. “In Saturn’s Rings” is scheduled to premier July 2014 and will be rolled out to planetariums, museums, science centers and other large screen theaters for years to come. It is dedicated to the memory of Carl Sagan and Stanley Kubrick. 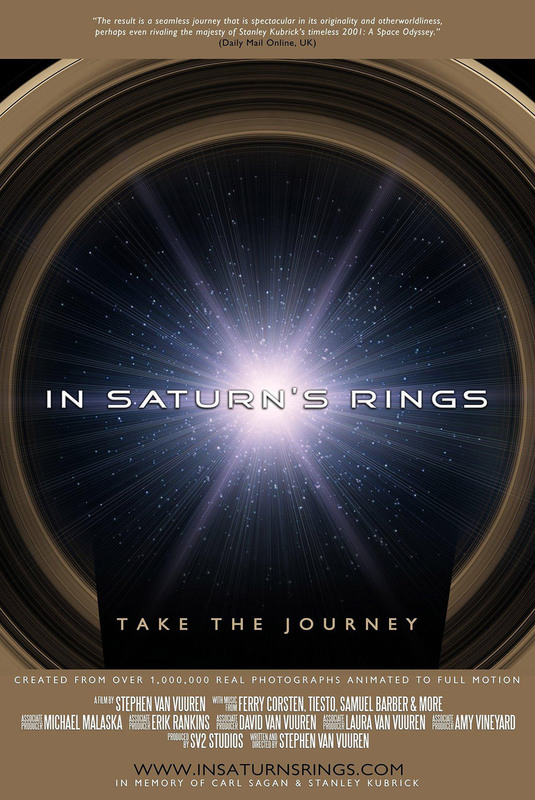 For more information, please visit the film’s website at: www.insaturnsrings.com/. The movie trailer may viewed at: www.youtube.com/watch?v=aJjeo2Br2AY/. Credit: NASA/JPL/Space Science Institute/SV Studios et. Al Image: NASA/JPL/SV Studios et al. Credit: NASA/JPL/SV Studios et al.